Terry Keefe has been performing music for over 40 years with a number of musical ensembles. 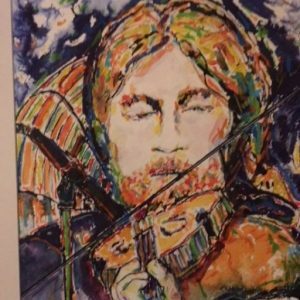 Based in Lincoln, Nebraska he has played a variety of musical styles such as bluegrass, blues, Celtic, swing, and Cajun. He currently plays Bluegrass music with Lincoln’s Toasted Ponies, Country Blues with Lincoln’s own Dr. John Walker, and is a member of Nebraska’s first Traditional Irish Band, Paddywhack, which still tours Nebraska as part of the Nebraska Arts Council’s Touring Program. Terry has earned many awards including the 1982 Midwest fiddle championship and the 1982 Iowa state mandolin championship. He was a member of Blue River Revue the band that won the 1982 national bluegrass band championship, and as a member of Paddywhack was a recipient of the 2000, 2001, and 2002 KZUM radio Member’s Choice Award for Best of World Music. In addition to live performances, Mr. Keefe has put his musical talents to work on the recordings of several local musicians. The list includes CD’s by John Walker, Chris Sayre, The Lightning Bugs, CA Waller, Terri Jo Dodson, The Loup River Nightcrawlers, Donnybrook, The Turfmen, Paddywhack, and The Toasted Ponies. Terry has released two solo CD’s: Celtic Awakening and In Tune With My Friends. Terry also was a member of the musical ensemble that performed for the Nebraska Reperatory Theatre’s production of “Robber Bridegroom” several years ago and appeared in the nationally broadcast NETV documentary “In Search of the Oregon Trail” as a pioneer and fiddle player. Terry has also appeared on the NETV series “33rd Street Sessions” as a member of the bluegrass group The Sandy Creek Pickers and as a backup musician to Laurie McClean. Other NETV specials to his credit include “St. Patrick’s Day Jamboree” with the Irish group Northwynd produced in 1984 and a special honoring the winners of local music festivals aired in 1983. In the Fall of 2000 Mr. Keefe appeared on the nationally syndicated radio show hosted by Tom May “River City Folk” with John Walker. On February 3, 2001 Terry, Dave Marsh, and Chris Sayre were chosen to play on the last set of tunes with The Chieftains on the Lied Center stage in Lincoln, NE. The Trio had their second chance to perform at The Lied in March of 2007, when they appeared for the “Free at Six” series as Paddywhack.